Balancing a five-course meal and family bonding activities can be tricky. On the one hand, our family likes to relax and enjoy one another’s company. On the other hand, we frequently have activities planned and don’t want to miss out on them, nor do we want them to feel forced and/or unnatural. At Holiday & Hearth our goal is to help families and friends create meaningful ways to connect with nature and one another. Every tradition and religion is welcome here. 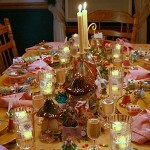 Whether you would like to host seasonal celebrations once in a while (like a May Fair or a Harvest Festival) or on a more regular basis, we have tips, tricks, examples, and resource suggestions to help you accomplish your goals… so explore, have fun, and be sure to share with our community your own pics and and ideas as some may even be featured!